Property in Cyprus was affected positively when in May 2004 Cyprus gained full membership of the EU, a momentous event for the country and also a great boost to its economy, which is expected to go from strength to strength – good news for property investors. There’s something of a buzz surrounding Cyprus at the moment. Many of us know it as a sunny, cheap and super-friendly holiday spot, but recently a variety of factors have converged on the Mediterranean’s third-largest island and caused many speculators to urge overseas homebuyers to catch the Cypriot property gravy train before its too late. Firstly, it was only fairly recently that Cyprus joined the EU (2004) – a move that will only increase its accessibility as somewhere to pick up an overseas place in the sun. Then there’s the euro issue. The International Monetary Fund has stated the Cyprus is well on track to join the single European currently as scheduled, at the beginning of 2008. Joining the euro should have a knock-on effect for the Cypriot economy, reducing interest rates, increasing the demand for property and consequently boosting house prices. Finally, Cyprus has until 2008 before it has to meet the EU requirements to charge 15 per cent VAT on building land. When it comes into effect, this new tax alone is expected to cause a five per cent rise in house prices. Predictions vary as to the scale of Cyprus’s mini property boom. Some expert believe prices could rise by as much as 50 per cent by 2008, while others claim the property market in Cyprus has been slowing in recent years, and predict closer to a five per cent annual return on any investments here. One thing’s for sure though, Cyprus is hugely popular among Britons. An estimated 60 per cent of all people who buy on the island are in fact from the UK. Presumably they just can’t get enough of the 300-plus days of sunshine each year. A final point to mention is that all of the above applies to the internationally-recognised Greek Cypriot-controlled Republic of Cyprus. The Turkish-held zone is not part of the EU and house prices here are far lower. However, recent property disputes have shown you must check legalities with a fine toothcomb to make sure the land and property will rightfully be yours, before committing to a purchase in this region. 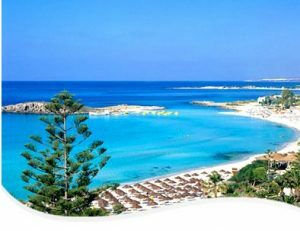 A number of low cost operators now offer flights to Paphos in the south of the island and Larnaca in the North. Departures from the UK take between four and five hours to make the journey. Arriving in Cyprus is a pleasant experience now that terminal improvements are fully operational at Paphos and new developments at Larnaca on track to open in late 2009. By the end of the year all flights to Cyprus will benefit from some of the most modern airport facilities in Europe. Airports: Larnaca/Paphos/Ercan (serves north Cyprus).